In martial arts like Judo and Brazilian Jiu-Jitsu, there’s nothing more frustrating than lacking a practice partner. It’s hard to master techniques without someone else. Enter the grappling dummy: a tool for developing ground, throwing, and submissions skills when training solo. In this piece, we’ll give you all the help you need to find the best grappling dummy on the market. Limbs with hands and feet make this a super sturdy and realistic pick. Versatility across different martial arts and a soft, sturdy touch. The vinyl construction and hands-to-chest design can stand up to your best throws. The freedom that comes with an unfilled model and a wealth of color/material options, mixed with a low price, make this a great value. A unique frame good for stand-up fighting techniques. A great pick if you’re looking to improve on your footwork. The most durable construction on the market. Good adjustability makes this an honorable mention. Ability to adjust the stuffing allows this dummy suit to fit your individual fight style. Polyester-coated vinyl makes it soft and sturdy. The dummy’s arms-to-chest design simulates a traditional fighting guard stance. Helps you articulate your strike locations and gives you the feel of a real opponent. A helpful design with legs curved inward to simulate a prepared opponent. Targets across the face and chest help your aim. Has enough height in the stance to practice kicks and strikes more effectively. Opens up the number of techniques to practice not possible with other models. Sturdy, triple-ply vinyl offers a solid surface built to last. Good height and weight options (70 pounds/64 inches or 100 pounds/68 inches) and a chain for hanging. The pre-filled adult model can soar past the $500 mark, making this one of the priciest picks on the list. Some users have reported an odd, vinyl-like smell after opening the package. The stitching may not be able to withstand certain hyperextension locks, which could pose a problem if you’re a serious trainer. Doesn’t look like an actual human being. This can take some of the immersion out of training. The durable design comes at a steep price. Bigger and heavier models can be harder to transport. Why Buy a Grappling Dummy? Convenient training at home or alone. Grappling dummies give you the freedom to practice moves at home without the need to find a partner. They’re a great way to hone self-defense skills. Cardio and strength training. Grappling with a dummy works both your heart/lungs and different muscle groups depending on the specific techniques you practice. Also, grappling is a great way to get some good interval training. Stress relief. Martial arts can be great stress relievers; dummies make it easy to integrate daily practice into your life without the hassle of finding someone else to spar with you. Flexibility. Flexible joints are an important aspect of fighting sports. Practicing with a dummy can help you increase your flexibility and comfort with certain grappling drills. This will make your technique better over time. Throwing/striking dummies can handle the most abuse. They’re good for high-impact moves like throws, takedowns, and strikes. The outer shell is more rigid to withstand the abuse of getting tossed around time after time. Made for practicing defensive guards and submission techniques, these dummies are among the most flexible on the market. Unlike a throwing dummy, these dummies are ideal for slow and controlled practice. These come in an array of different “flavors.” Jiu-Jitsu dummies stay in a lying or kneeling position for ground techniques. Wrestling throwing dummies (and some Judo options) often come without arms and are heavier for conditioning. 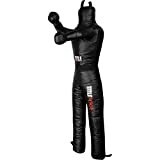 MMA punching dummies come in an upright or lying position and can survive high-impact moves like throws and strikes. Headquartered in Glendale Heights, IL and famous for their MMA-line dummies, this company is a true leader in the MMA subset of martial-art-specific models. Established 20 years ago in Lenexa, KS, Title Boxing is known for their versatile Freestyle Dummy. This company, out of Raleigh, NC, is another leader in the MMA-specific game, known for their MMA and Deluxe MMA Dummies. Durability and versatility are the biggest influencers of the price here. Different price points will offer different levels of quality and features. $75 and under: Models with basic materials and stitching that may stand up to less intense use than higher-end options. Often lack additional features. $75-$150: Step-up materials such as leather and better stitching are common for better durability. Many models come with some extra, useful features like a chain for hanging the dummy. $150+: Designs with additional features for hyper-realism to feel as close to a human as possible. Top-of-the-line materials are standard for durability. Practice grappling and ground moves with limbs you can actually move. Most submission dummies have the most range, but limbs on any model will often come in a few standard positions. Again, wrestling and Judo dummies will often forego arms entirely. Markings in key strategic areas like the face and torso can make your moves as accurate and effective as possible. The weight and feel of the dummy should be as realistic as possible. Materials like leather will feel and act more like skin than regular fabric. Additionally, different types/amounts of stuffing will provide a softer or firmer feel. Some models will even come unfilled so you can add as much stuffing as you need. Size and weight: The dummy’s mass should match your typical opponent. The size range varies, but in general, 59-70 inches for adults and 40-47 inches for kids are good benchmarks. Different weights will provide different resistance; more weight means more resistance. We recommend lighter models for kids and beginners. Durability: In general, stronger materials like leather or vinyl will stand up to more abuse than plastic or fabric. It’s also important to look for multiple rows of stitching in the model’s seems to resist rips and tears better long-term. Flexibility: A good degree of flexibility and a few standard positions are important for most grappling dummies and certain martial arts. However, stiffer limbs will provide more resistance and a more realistic feel. The amount of customization, an appealing, practical design, and high-quality construction all make the Deluxe MMA our choice overall. Available in both youth and adult sizes, filled or unfilled, you can make sure this dummy fits your style. Made of polyester-coated vinyl, this model gives you all of the durability of leather with a softer touch. It’s also designed to be used in a variety of different sports and arts, from Brazilian Jiu-Jitsu to wrestling, Judo, and MMA. Uniquely, the limbs feature hands and feet. A drawback of this model is the price, as a filled adult model can soar up above the $500 mark. This is due to the size and quantity of materials as well as the quality of the stitching. A customizable design along with good material construction, versatility, and an awesome price point give the Celebrita MMA Grappler top billing in the value department. Coming unfilled, this design allows you to adjust the weight and stiffness as you please. It comes in a wide array of color choices and material options (canvas or leather) and can stand up to both grapples and strikes. Its legs are curved at the hips, simulating an opponent’s prepared stance, and features a targeted face and chest. Some people report that the stitching isn’t quite strong enough for extended, full-force, hyperextension locks. This weakness is a problem if you’re really planning on putting the pressure on the dummy. If you’re a serious trainer and instructor, you may want to look elsewhere. With a standing design that’s built for strikes and throws, this is our top pick as far as throwing dummies go. A sturdy, vinyl design makes sure this dummy remains standing to respond to your hardest punches, kicks, and takedowns. This punching dummy has arms held up against the chest to protect its most vulnerable areas. The design simulates a traditional fighting stance, which is indispensable if you’re focusing on positioning your strikes effectively to counter an opponent’s defenses. A few users report an odd, leather-like smell upon initial arrival, but it seems to fade over time. This can be an issue if you’re sensitive to chemical smells or harsher odors in general. This is a truly unique, naturally-upright trainer. The VS.2 makes the list for its original design and versatility across martial arts. Proclaimed as “the first grappling simulator to stand upright,” we’ve found this to be true for a product not supported by a chain or rope. The dummy offers good training for stand-up combat. This is a feature you don’t find in many dummies, making it a great choice if you’re looking to work on your upright technique before transitioning into takedowns and grapples. A downside, however, is the lack of resemblance to an actual human being, unlike most other trainers. This can make moves hard to transfer to a real opponent and may throw off your natural rhythm. An adjustable weight, a stiff and sturdy design, and a unique standing position make this a great choice to check out. Coming pre-filled, this model comes with good height and weight options: 70 pounds/64 inches or 100 pounds/68 inches. It also features one of the most durable exteriors on the market, with a triple-ply synthetic leather cover. A unique loop at the top of the head allows it to hang from a chain or rope for stand-up use. The rigidity of this dummy, mainly due to its thick and durable materials, can make practice difficult. Its sheer size and weight, which some users have reported as heavier than listed, also make it awkward to move around. If you’re looking to cross-train across different martial arts, flexible dummies offer the most versatility. Dress the dummy in a uniform like a gi to help with moves like collar and sleeve grabs. Q: Can a grappling dummy be useful for takedowns? A: Certain dummies can survive high-impact moves like strikes and takedowns, some can’t. Performing takedowns on dummies that can’t take the abuse can lead to rips, tears, and breakage. In general, leather and vinyl construction can withstand these moves. Be wary with canvas, plastic, and fabric materials. Q: What should I use to stuff an unfilled dummy? A: This varies based on how heavy, light, firm, or soft you want your dummy to be. Traditional stuffing is good for a light or medium touch. Heavier materials like shredded towels or beans offer more rigidity and weight. Q: Can I fill the dummy myself? A: This depends on the model. If your dummy comes pre-stuffed, and the manufacturer doesn’t recommend changing the stuffing, you should avoid it. Empty dummies need to be filled and don’t require additional tools or assistance. There are no rules when it comes to how to fill your grappling dummy, it all comes down to personal preference. Q: How do I make my dummy stand? A: Some models stand naturally, others come with loops or attachments to hang the dummy from the ceiling. A few only come in a seated position for ground techniques. Grappling dummies are a martial artist’s best friend, making it easy to practice moves at home when no one is around. Overall, the Ring to Cage Deluxe MMA is the most complete and versatile model available. To save some money, the Celebrita MMA gives you a solid experience with an impressive sticker price. For specific niches like standing use, our honorable mentions fill in these needs. Do you train with a grappling, BJJ, MMA, or Judo practice dummy? Like our list? Did we miss anything? Let us hear it down below!